A few years ago, I stocked up on vegetarian friendly foods as a hospitality nod to a few good friends. 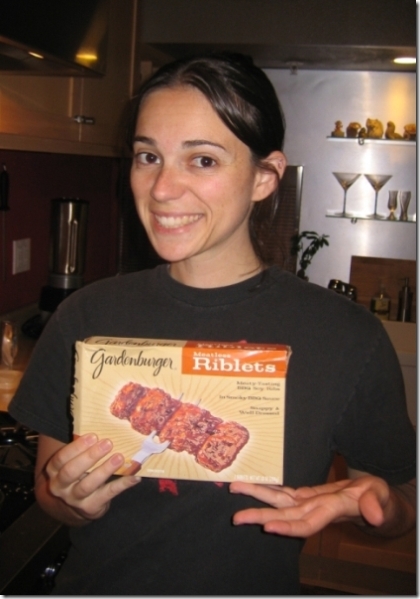 One of the items I picked up was Gardenburger’s “Meatless Riblets“. What can I say, I was intrigued. Lauren opened the freezer, took one look at them and said “no vegetarian is ever going to eat these, they are too meat-like.” Over time the riblets got buried in the freezer, to be rediscovered about 2 years later (in December). When I found them I wondered aloud how they would taste. Lauren continued her skepticism and claimed that there was no way she would ever come near the meatless riblets. Well at long last the moment of truth arrived. Back from the gym tonight I was famished. We’re a little low on food after the recent vacation, and I spied the riblets in our freezer. I knew what my evening snack would be, and my wife could forage for an alternative if she wasn’t interested. I opened the box and inside were two vacuum sealed frozen burgundy blocks. Opting for the grilling instructions, they went onto the grill pan (hey, it gets cold out here in January) for the requisite 4 minutes per side. To add to the evening’s humor I recited some anecdotes from the back of the box around the virtues of vegarian food, vegetarian ribs (no one ever chokes on a bone), and Gardenburger in general (which is a pretty self-effacing company). About 2 minutes in, Lauren started to change her tune: “uhm, those smell pretty good.” By the time they were ready, her resolve was completely broken. I managed two bites before having to offer up a taste, at which point a second fork came out of the drawer. The funny thing is they really did taste an awful lot like the BBQ ribs I had while growing up, but without the bones or extra grease! When the riblets were gone (including a full sweep of any remaining sauce), my wife joked: “who knew that meatless riblets would be the first step in converting me back to eating beef.” After years of teasing over this tiny box, I was finally redeemed. This entry was posted in Food on January 24, 2008 by kenny.